Microsoft Project Online is a flexible online solution for project portfolio management (PPM) and everyday work. Delivered through Office 365, Project Online enables organizations’ to get started, prioritizes project portfolio investments and delivers the intended business value—from virtually anywhere on nearly any device. Try Project Online for free now! Find out more by booking an online discovery session with one of our Microsoft Project experts. The free workshop will comprise an interactive session exploring all aspects of evaluating and implementing the Project Online solution. A Microsoft Project Online test environment for 5 users, for one month and we will support your test with 2 hours of expert know how. IT initiatives today are driving digital transformation, aimed at creating business value and competitive differentiation. As the changing business environment increases the number, size and complexities of these strategic projects, your success in this transformation journey will depend on your ability to manage them with the higher levels of productivity and efficiency. Handling and analyzing projects, portfolio, resources and risks is essential to remain competitive. Atos proven expertise in operational excellence supports and enables this by providing effective project and portfolio management across departments, business units, and countries. Helping you to deliver the promised value on budget, on time and to the required quality. Microsoft PPM improves decision making through improved insights and monitoring. By focusing on business strategy and the processes of project management (such as schedule- and resource management, cost management, portfolio management, reporting and workflows) it maximizes the use of resources and enhances company efficiency. Extensive expert knowledge and years of experience enable successful customer solutions. Delivery of customized solutions by comprehensive requirements analysis. As Microsoft’s Global Systems Integrator partner with “Gold Competency” status we guarantee the highest quality in delivery and support. Within the framework of an introduction of PPM, typical business processes have to be modified and your employees must deal with newly established tools. The management has to be convinced regarding the sustainability of this investment and expects verifiable cost reduction in project handling within the organization or at an enterprise-wide level. We would like to accompany you, end-to-end along this path, starting from the initial discussion through to the successful introduction of PPM and continuous operation of the system. Microsoft Office PPM provides a solid base for optimized working, while maintaining your operational efficiency. For this, an accurate and careful handling of the PPM tool is essential. This allows us to support your operation and maintain highest availability so that your business processes and their strategic implementations correspond to each other. The components of Microsoft Office PPM are a challenging – but extremely helpful tool. To gain optimum use of scope and advantages, we offer you customized trainings which consider your processes for a role-based handling of the tool. Individual offers can be proposed on request. Apart from performing complex planning tasks, our certified project managers give you valuable input to improve your project management process and additionally offer you facilitation of project workshops (e.g. risk management workshops, and lessons learned workshops). Do you want to switch from one release of Microsoft Project Server or other tools to the latest release? We offer you a one stop solution for conceptualization and implementation. We run your Microsoft PPM solution in our data center (as a cloud based solution “on-demand”), providing maximum security with minimum downtime. In this context we offer you a “private cloud” or “public cloud” solution (SaaS – Software as a Service). The Atos PPM “on demand” solution offers you high availability with full flexibility. You can for example expand your solution by a Reporting Cockpit for standardized reporting or by interfaces to integrate your PPM solution into your application landscape. 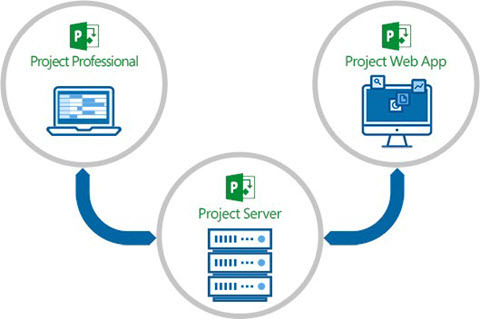 We possess the expert know-how to ensure optimized operation of a Microsoft PPM landscape with Microsoft Project Server, Share Point Server and a SQL Server. In this context we consider your processes and develop an individual solution together with you. Our Atos Reporting Cockpit extends the Microsoft PPM solution by a flexible reporting solution based on your reporting standards. Historiography of your project data allows a quality proofed report creation at the push of a button. Reporting cycles can be considered according to your requirements. In this context, the Reporting Cockpit integrates completely in the PPM solution and also offers the integration of other “Line of Business” data or manual commentaries. The MTA, as application for Microsoft Project Professional, is a useful tool to graphically display and analyze the scheduling situation of project milestones. Especially developed by Atos for this purpose, the application is available in the Office store and represents an extension to Microsoft Project Professional. The MTA chart can be integrated in project reports easily and quickly. 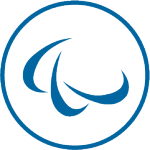 Here you will find the Atos MTA App. 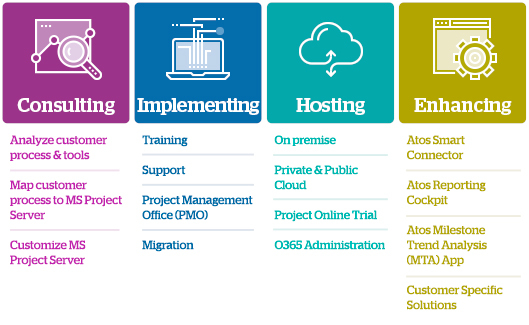 Atos is pleased to support you by customizing specific solutions for you. Via the Self Registration Portal new users can comfortably apply for access to the Project Server. At the push of a button, an administrator can grant access to the new user according to the requested security level. The project progress can be displayed graphically by the assignment of so called progress points even at mere schedule planning without resource or cost planning. Atos SMART Connector to (bi-directionally) link the Project Server with e.g. SAP, Active Directory and other applications.